A Grand Conquest taking place in notheast Jugdral. A ton of new maps for it were added. Saias Grand Hero Battle Rerun. Niles's daughter. Calm and intelligent but prone to intense bouts of daydreaming. Appears in Fire Emblem Fates. Odin's daughter. A daydreamer who applies a flair for the dramatic to her magic. Appears in Fire Emblem Fates. A newly appointed Nohrian knight and Corrin's childhood friend. Often asked for advice. Appears in Fire Emblem Fates. The king of Nohr. Intends to invade and rule over Hoshido. Appears in Fire Emblem Fates. シャイニングボウ: Effective against flying foes. If foe's Def ≥ foe's Res+5, deals +7 damage. シャイニングボウ＋: Effective against flying foes. If foe's Def ≥ foe's Res+5, deals +7 damage. 霧氷のナイフ: Accelerates Special trigger (cooldown count-1). If unit initiates combat and foe uses sword, lance, axe, or dragonstone, grants Def+20 during combat, and if foe can counter, unit makes a guaranteed follow-up attack. After combat, if unit attacked, inflicts Def/Res-7 on target and foes within 2 spaces of target through their next actions. 魔書ミステルトィン: Accelerates Special trigger (cooldown count-1). At the start of turn 1, grants Special cooldown count-1 for each magic ally on your team (including unit). 暗夜竜のブレス: Neutralizes "effective against dragons" bonuses. At the start of turn 4, deals 10 damage to foes within 3 spaces, and restores HP to unit = number of foes within 3 spaces × 5. If foe's Range = 2, calculates damage using the lower of foe's Def or Res. 攻撃の大応援: Grants Atk+4 to target ally and allies within 2 spaces of target (excluding unit) for 1 turn. 攻撃の大応援＋: Grants Atk+6 to target ally and allies within 2 spaces of target (excluding unit) for 1 turn. 攻撃魔防の孤軍1: If unit is not adjacent to an ally, grants Atk/Res+2 during combat. 攻撃魔防の孤軍2: If unit is not adjacent to an ally, grants Atk/Res+4 during combat. 攻撃魔防の孤軍3: If unit is not adjacent to an ally, grants Atk/Res+6 during combat. 速さ魔防の連携1: If a movement Assist skill (like Reposition, Shove, Pivot, etc.) is used by unit or targets unit, grants Spd/Res+2 to unit and target ally or unit and targeting ally for 1 turn. 速さ魔防の連携2: If a movement Assist skill (like Reposition, Shove, Pivot, etc.) is used by unit or targets unit, grants Spd/Res+4 to unit and target ally or unit and targeting ally for 1 turn. 速さ魔防の連携3: If a movement Assist skill (like Reposition, Shove, Pivot, etc.) is used by unit or targets unit, grants Spd/Res+6 to unit and target ally or unit and targeting ally for 1 turn. メイドの頭飾り: A maid's headpiece from Flora. This is the authentic Nohrian object, straight from Castle Krakenburg. メイドの頭飾り・極: A maid's headpiece from Flora. Only the head maid is allowed to wear this superior-quality item. 騎士の額当て: A knight's headpiece from Silas. This gear is given to those who earn the title of knight. 騎士の額当て・極: A knight's headpiece from Silas. This special piece of gear is given to those who reach the title of paladin. 読書用眼鏡: According to Nina, your eyes won't get tired if you wear these—no matter how much, or what, you read. 読書用眼鏡・極: Nina says that these glasses will let you keep reading into the dead of night. Clear Book II, chapter 1, part 5 with Fjorm on your team. All four allies must survive. Clear Book II, chapter 2, part 5 with Fjorm on your team. All four allies must survive. 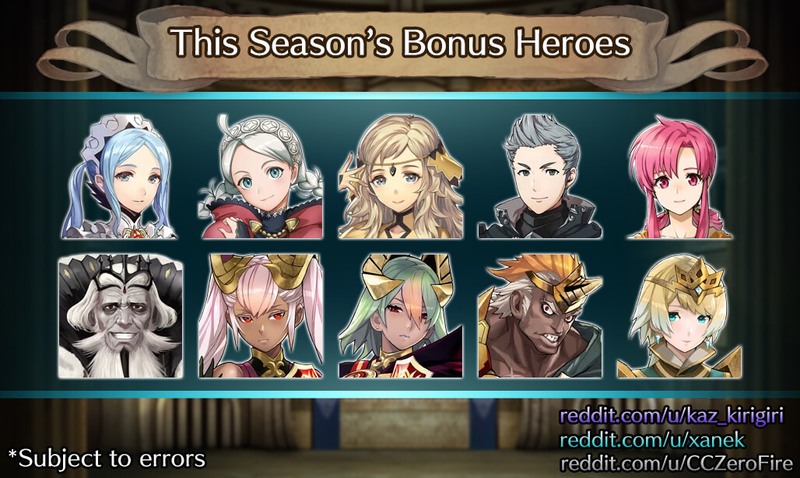 Clear Book II, chapter 3, part 5 with Fjorm on your team. All four allies must survive. Clear Book II, chapter 4, part 5 with Fjorm on your team. All four allies must survive. Clear Book II, chapter 5, part 5 on Hard difficulty with four infantry allies on your team. All four allies must survive. Clear Book II, chapter 6, part 5 on Hard difficulty with four armored allies on your team. All four allies must survive. Clear Book II, chapter 7, part 5 on Hard difficulty with four cavalry allies on your team. All four allies must survive. Clear Book II, chapter 8, part 5 on Hard difficulty with four flying allies on your team. All four allies must survive. Clear Book II, chapter 9, part 5 on Lunatic difficulty with four infantry allies on your team. All four allies must survive. Clear Book II, chapter 10, part 5 on Lunatic difficulty with four armored allies on your team. All four allies must survive. Clear Book II, chapter 11, part 5 on Lunatic difficulty with four cavalry allies on your team. All four allies must survive. Clear Book II, chapter 12, part 5 on Lunatic difficulty with four flying allies on your team. All four allies must survive. Clear Book II, chapter 13, part 5 on Lunatic difficulty with Fjorm on your team. All four allies must survive. Clear the Grand Hero Battle against Saias: Bishop of Flame with Anna on your team. Clear the Grand Hero Battle against Saias: Bishop of Flame on Lunatic difficulty with Saias: Bishop of Flame on your team. Defeat Saias: Bishop of Flame at level 40 or higher using Anna. Defeat Saias: Bishop of Flame at level 40 or higher using Saias: Bishop of Flame. Clear the Grand Hero Battle against Saias: Bishop of Flame on Lunatic or higher difficulty using only infantry allies. Clear Book II, Chapter 13: Part 1 on Lunatic difficulty with an axe ally on your team. All four allies must survive. Clear Book II, Chapter 13: Part 2 on Lunatic difficulty with a sword ally on your team. All four allies must survive. Clear Book II, Chapter 13: Part 3 on Lunatic difficulty with a lance ally on your team. All four allies must survive. Clear Book II, Chapter 13: Part 4 on Lunatic difficulty with an axe ally on your team. All four allies must survive. Clear Book II, Chapter 13: Part 5 on Lunatic difficulty with a sword ally on your team. All four allies must survive.